← What is the balance in your ‘I can trust you’ Bank Account? The X Factor in selling … is this the most brilliant strategy ever? 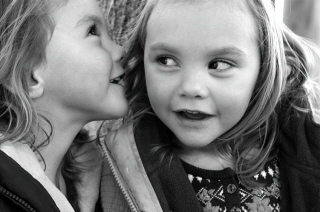 Look at these two young girls and ask yourself…What do you see? Do you see a sharing of common interests? Do you see shared secrets? Do you see an absence of guile? Do you see a sense of fun? Do you see genuine affection? Do you see honesty? Now here is my next question ……Wouldn’t you be more than pleased if this photo was actually an accurate mirror of a typical interaction between you and your prospect? Imagine recapturing that innocence of youth. Imagine your prospect showing genuine interest in you (Let’s just forget about your product for a minute) Imagine your prospect sharing secret concerns with you. Imagine your prospect relaxed and displaying non-threatened body language. I am about to give away what I believe to be the X Factor for success in sales. This factor comes after more years than I care to admit to in sales and sales management. At this point, I have to warn you, if you are a selling coward there is no point in you reading any further. This X Factor for successful selling requires courage. OK, so let’s assume the selling cowards have now left the room. Those of you who have the courage, draw near. Yes you are right in part, yes the X Factor does involve Honesty but not just the Honesty you would have imagined. I fully endorse the need to be honest about facts. It has always been easy for me to be honest about facts because I still go red if I tell an untruth. I can hear you saying “Tell me something I don’t already know” OK let’s look at and focus on the actual X Factor for success in selling ….. Remember how we talked earlier about how we would like our prospect to behave. Well why should they behave honestly, why should they tell us honestly what they really think. Think about how stupid we are when we clearly want the prospect to be honest about their feelings while we sit there all professional and wonderful and completely dishonest about how we feel. If you have the courage and you want to deliver the perfect sales presentation, stop presenting and start talking with the prospect. Start by being honest about your feelings. As a sales manager I have often begun a debrief with a salesperson after they missed a sales by asking this simple question, ”What do you know about the client?” Typically, the salesperson will start telling me what position the prospect holds in the company, how he is looking to update the current model etc. At this point, I usually stop the salesperson and qualify my original question “What is their family situation, what are their interests and even more importantly what do you think their buying style is? 99% of failed sales can be put down to our failure to really get to know the prospect. It is all about being honest about facts and feelings. Sales presentations don’t always go well. There often comes a time in your presentation when you sense that your prospect is just not buying. You could keep prattling on or you could pause and make an honest comment such as …. If you have been honest about the mood of this encounter and you have established a real relationship you can afford to bust the whole thing open with an honest question such as that stated above. Of course, when you are ‘putting on’ honesty, especially honesty about feelings and emotions, your body language is likely to expose your true feelings and the disconnect result in loss of rapport. Consider the last sale you lost. Take time to go through it honestly, step by step, in your mind. As you do take a note of how many times you could have been more honest about different twists and turns in your interaction with the prospect. Did you notice your prospect changing their posture or facial expression? Did you notice your voice change in tone, speed or inflection? You may not realise the hidden messages you send when you are being less than honest about facts and feelings. You may have to think about how to say it but I can tell you one thing for sure, you need to start saying it.